With the process of seating tire beads taking less than one second to complete, the tire bead blaster system you choose should be efficient and easy to operate. By using a large volume of compressed air, the bead blaster helps seat the beads of the wheel assembly. Because of its quick and punctual job, it is important to choose the best tire bead blaster for the tires you most commonly work on. With ease being the primary focus, you want to be able to quickly and efficiently seat your tire beads without worry. Obviously an important part of your tire change, you want to make sure you are choosing the right product to work with. One popular option is the Nationwide TC-BBT5G Bead Blaster 5 Gallon Tank. This tank is a “rapid-fill” bead blaster that is designed to handle anything from small ATV tires to large trucks. Because of its versatility and portability, it is the perfect tool for safely seating hard-to-seat tire beads. This is much more of a standard option than most tire-specific blasters, making this a perfect everyday go-to tire bead blaster. 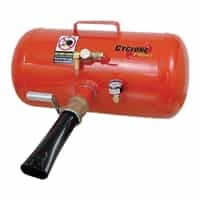 Another option you have is the Gaither Tools GB-5Z 5 Gallon Bead Booster GAIGB-5Z. This tool is easy-to-use and features a double barrel, which creates a better lift by directing the air around the tire. 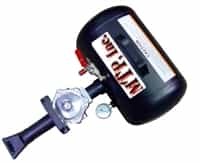 Quick and easy to use, it is completely portable and works on all trucks, RVs, ATVs, and some agriculture tires. This machine is equipped with a release valve safety lock that prevents it from unintentionally discharging too early. A third option available is the Cheetah Bead Seater Tool. This bead blaster features a six-gallon tank and can seat even the hardest tire beads. Because of its ease of tire bead seating, this tool essentially saves time and money. Built for commercial vehicles, such as large truck tires, ATV tires, and automobile tires, this tool is a must have in your garage. No matter what your specific needs are, one of these great tire bead blasters will work wonders in your garage.